NOTICE: Gallery Gachet will be closed until Wednesday July 21, we apologize for the inconvenience. In celebration of International Mad Pride Day on July 14th, 2010, Gallery Gachet continues its bi-annual tradition of honouring, by way of a month-long arts and education festival, this historic but little-known social change movement founded by psychiatric activists in the 1970s. As an arts collective whose mandate advances art and healing as a path to social and economic justice, Gallery Gachet embraces Mad Pride as a unique vantage point from which to address current world issues in an alternative framework: that of cultural and global mental health. 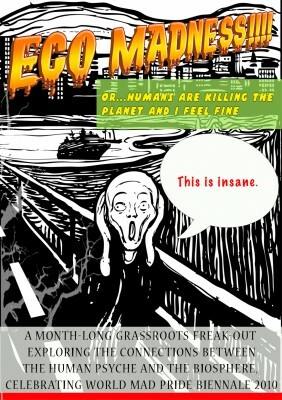 This year’s biennale, “ECO Madness!!! Or… Humans Are Killing the Planet and I Feel Fine,” engages the concept of ecopsychology: an emerging field of study that criticizes mainstream psychology for ignoring social, and especially ecological, determinants of mental health. There is, according to the online International Community of Ecopsychology, a “synergistic relation between planetary and personal well-being” that is absurdly and resoundingly ignored in common therapeutic practice. Through art, film, theatre, music and educational events throughout the month of July, Gallery Gachet aims to create a safe and radical (literal meaning: “root”) space for a total creative FREAK OUT over what humans are doing to the Earth and to ourselves. As mental and emotional canaries-in-the-mineshaft, artists of heightened sensitivities and awareness (often proclaimed unstable or “MAD”) claim, via creative expression, the right to experience breakdown, despair, laughing hysteria, sobbing rage, scattered joys, ground-breaking communications with plants/animals/rocks, and episodes of epic, debilitating, destabilizing, and heartrending empathy as healthy and appropriate responses to Ecocide: the killing of entire living ecosystems by dangerously pathological human ends (such as the devastation we are right now witnessing unfold in the Gulf of Mexico and impending development of the Alberta tar-sands). As Theodore Roszak proclaims, “The context for defining sanity in our time has reached planetary magnitude.” ECO Madness!!! at Gallery Gachet is a call to hearts and creative arms to demand an Earth-defined reality-check and a deep, cultural reassessment of what it means to be healthy and well-adjusted in this life, before the biosphere’s ability to sustain such life is irreparably damaged. If our planetary home cannot sustain life, it cannot sustain Pride of any kind or any social justice movement at all. In other words, there is no social justice or mental health if we do not come to our senses– return to true ecological sanity– and include all living things in our circles of inclusion and justice. The Gallery Gachet Collective calls on all the Mad and Maladjusted, who comprehend true sanity for having lost, regained, or else redefined it– as Dr. Martin Luther King understood so well when he called for an “Association of the Maladjusted” to combat oppression and injustice– to rise up as leaders in their communities, to shake off the psychic numbing of denial, repression, and conformity that allows us to live in non-life-sustaining ways, to rediscover our deep love, respect and passion for, and physiological dependence upon, the natural world as a precondition for any sane definition of mental health, and to help others do the same. In the words of author Daniel Quinn: AWAKEN OTHERS AS YOU HAVE BEEN AWAKENED. eco art exhibition, radical films, mad poets’ cabaret, indie bands, DJ dance party, eco-psych free skool, panel madness: ‘Deep Aesthetics,’ psycho-geography bike ride, Ecocide Recovery Support Group… and more!! visit www.gachet.org for complete festival line-up and details! Or grab a festival guide at the gallery. • Highlighting the global movement advocating for mental health and human rights through sharing and showcasing artistic expression on these themes. • Connecting artists’ work that addresses the social determinants of mental health. • Challenge stigmas of people living with mental health and trauma issues. • Providing a forum for discussion and education on these and related (contextual) issues. • Creating links to the rights of individuals for holistic health and security worldwide.